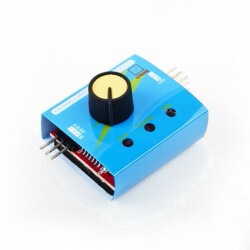 Supported speed controllers (listed below) can now use a wireless connection via the use of the HW WiFi express module for the following operating systems; iOS/Android phone (using the HW LINK APP) users can easily and remotely program the ESC parameters displayed on the smart phone to their own preference. The data-logging capability allows users to know the running status of their power system. This App also allows users to save parameters, export settings and share the info on FaceBook, Instagram, Wechat and etc. The Wifi Module is a complete different concept from the way the HOBBYWING LCD program box works, all the parameters of the wifi module are displayed all in one via the graphical and interactive interface with dropdown menu's and scroll bars. Now users can program their ESC in a much more user friendly interface without delay. 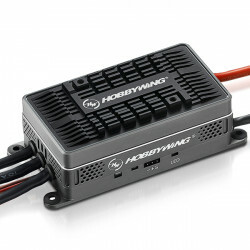 This WiFi module is smaller,smarter,lighter and only 1/6th of HOBBYWING LCD program box in size and weight. It has a hardwired programming cable to connect to the ESC not like the LCD program box which needed an extra programming cable to connect to the ESC.